"USA" redirects here. For other uses, see USA (disambiguation). The United States of America (commonly referred to as the United States or America and abbreviated as "USA or "US") is an Earthican federal republic. 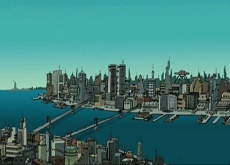 It is the main location for Futurama and also the country in which the show is produced. While Earth in the 31st century has become a single nation, many of the original constituent countries still remain, including the USA. The Earth government is modeled after the USA government of today and the flag of Earth, Old Freebie, is similar to the American flag. Because Earth's government is seen more than the USA's government on the show, not much is known about the country. The U.S. president is never mentioned, only the Earth president. Cities in the country which had been destroyed, and now rebuilt, have changed their names to "New" cities, like New New York. The United States was founded during the American Revolution in the year 1776. Many soldiers, such as "Minuteman" Yancy Fry, fought in that war. By the 20th century, the United States had became a super power. It was also the first country to send a human to the Moon (the lunar landing site was lost until it was found in the year 3000) and Mars (Philip J. Fry, II was American). Between the 21st and 31st centuries, some of the US States have changed their names. Also, two of the states, California and Pennsylvania, have split into two parts (California into HighCal and LoCal and Pennsylvania into Penn Republic and Sylvania). New New England is mentioned by Bender in "The Cyber House Rules", where he calls the orphans "princes of Maine" and "kings of New New England". The addition of another "New" may be a reference to the fact that it is not just the state of New New York that has been destroyed, but that entire region. If the revolution against Britain had failed, the country would have been part of West Britannia, as revealed in "All the Presidents' Heads", and the name for the failed revolution would be the "Colonial Dust-Up". Most of the changed names of the states are references to either modern technology (e.g. eHIO, iOwa) and science (Muontana), or real-world states' associated stereotypes (Taxachussets, Nukevada). For the split states, HiCal and LoCal likely refers to the real worlds' progressively increasing attention to healthy diet, while the split of Pennsylvania into the Penn Republic and Sylvania may be a reference to the split of Czechoslovakia into the Czech Republic and Slovakia in 1993. All episodes/films except "Where the Buggalo Roam"
This page was last edited on 1 July 2016, at 14:31.